When you read this article, maybe you already decide to draw a work process map, or you are still in hesitation. Here we would like to help you know more about the benefits of mapping work processes, which intends to give you a clearer idea on how important it is. Mapping here means the activity of creating a detailed flowchart of a work process showing its inputs, tasks, and activities, in sequence. It is a great way to present complex process in a simple to understand manner. Mapping could be simple, but also could be a huge task, which requires a group effort and a long time process. It depends on the drawing content, complexity, and way of drawing. 1. To give staff a comprehensive understanding of the work process and help specify their responsibilities. 2. To train a new employee or a new hand of a certain work. 3. To clearly recognize which area has the need of improving. 4. 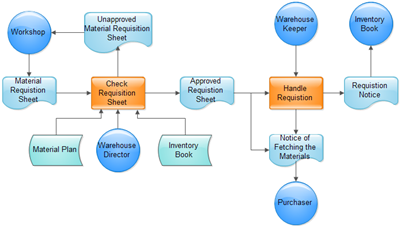 Flowchart is the visualized depiction of workflow. Creating it can give you a more profound understanding of the whole work process. 5. Drawing process is the collection of each participant's knowledge, some of which are years of accumulation. Therefore, this activity is endowed with great meaning, which can be seen as a unique treasure for the organization. 6. When people have different opinions during process modeling, they have to clear up the ambiguity by face to face discussion and idea exchange. It's such a good platform for the staff to gather together and communicate, which can also improve their working enthusiasm.